“I view derivatives as time bombs, both for the parties that deal in them and the economic system. Basically these instruments call for money to change hands at some future date, with the amount to be determined by one or more reference items, such as interest rates, stock prices, or currency values. Unless derivatives contracts are collateralized or guaranteed, their ultimate value also depends on the creditworthiness of the counter-parties to them. But before a contract is settled, the counter-parties record profits and losses – often huge in amount – in their current earnings statements without so much as a penny changing hands. Reported earnings on derivatives are often wildly overstated. That’s because today’s earnings are in a significant way based on estimates whose inaccuracy may not be exposed for many years. The errors usually reflect the human tendency to take an optimistic view of one’s commitments. But the parties to derivatives also have enormous incentives to cheat in accounting for them. Those who trade derivatives are usually paid, in whole or part, on “earnings” calculated by mark-to-market accounting. But often there is no real market, and “mark-to-model” is utilized. This substitution can bring on large-scale mischief. As a general rule, contracts involving multiple reference items and distant settlement dates increase the opportunities for counter-parties to use fanciful assumptions. The two parties to the contract might well use differing models allowing both to show substantial profits for many years. In extreme cases, mark-to-model degenerates into what I would call mark-to-myth. The derivatives genie is now well out of the bottle, and these instruments will almost certainly multiply in variety and number until some event makes their toxicity clear. Of course, Buffett’s warnings went completely unheeded and five years later we were in the midst of the Great Recession, the effects of which we have yet to fully recover from. And while experts agree that the cause of the Great Recession were varied and complex, there is no denying that the large amount of OTC derivatives on the market had a major exacerbating effect, if not being a primary cause. 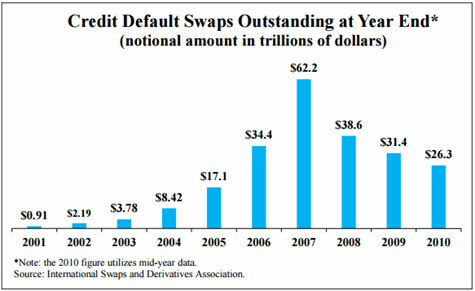 Without derivatives such as the Credit Default Swap (CDS), the crisis could at least have been relatively contained. Take a look at the chart below, which shows how the amount of CDSs outstanding peaked right before the recession. The graph was taken from a National Center for Policy Analysis paper exploring the role of derivatives in the financial crisis (PDF). The paper concludes that credit default swaps amplified the boom and bust in the property markets. However, other pundits have more strongly argued that derivatives were the primary culprit in causing the financial crisis. The paper by Hera Research goes on to note that regulators appeared to not have learnt their lesson, noting that even as national debt levels continue to grow, the amount of OTC derivatives far outpaces it. Ah yes, at $500 trillion outstanding, OTC derivatives are merely an ‘important asset class’. Understatement of the century right there. 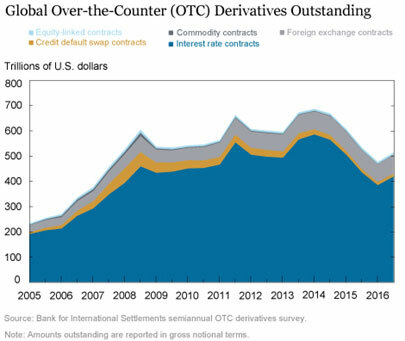 At the height of the financial crisis, the total notional outstanding amount of the OTC derivatives totaled $600+ trillion, so a reduction to the $500 trillion level seems barely noticeable. A significant part of the financial landscape indeed. You might have also noticed that in 2005, the total outstanding was only just above $200 trillion. When Warren Buffett made his declarative statement, the total outstanding was under $200 trillion. And now, total notional value of OTC derivatives stands at $500 trillion, with $222 trillion of it being held by the Top 25 US banks. This, coupled with slowing economic growth and the fact that banks are also facing slowing lending growth could result in another explosive cocktail. And we haven’t even recovered from the first one. Despite high investor confidence and business sentiment, the hard data simply does not back it up. That’s why intelligent investors are diversifying their portfolio into assets which hold hard value, such as gold and silver. The value of these assets is not propped up by derivatives and if the financial weapons of mass destruction explode again, you will be better prepared. « Silver Push To $20 In Last Half Of 2017?